After owning an iPhone for several years, I was pleasantly surprised when I recently learned a new iPhone shortcut that I now use everyday. You can jump to the top of your Contacts list by simply touching the “top bar” which is where the time and battery level indicator are. See the picture on the right to understand this more easily. Simply touch where I put the red mark in the photo. 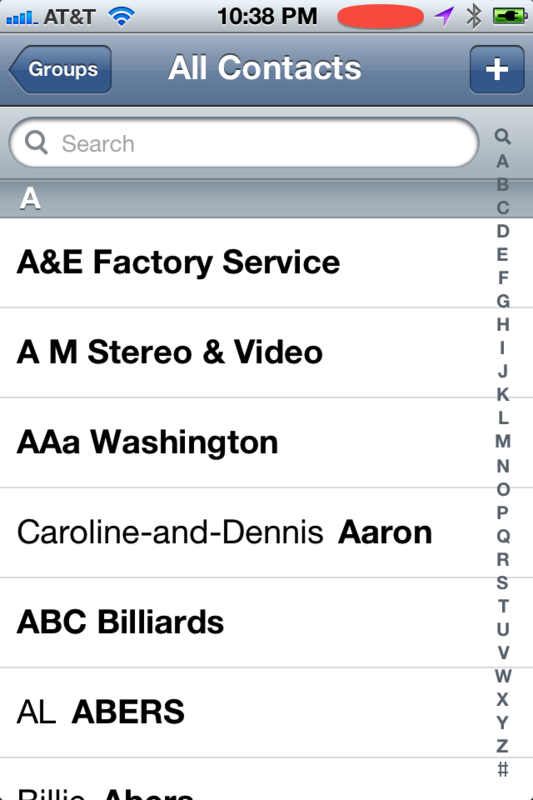 I use this feature to jump to the top of my Contacts list so I can easily get to the Search field. I have a lot of contacts ,so I find the fastest way to locate the individual record that I need is to use the Search function. I can now easily get to it by tapping the menu bar. This feature is available on iPhones, iPads and iPod Touches. It works on any long list. If you have many email messages in your Inbox, for example, you could tap the menu bar to jump to the most recently received email message. Read more about Apple, contacts, iPhone, productivity tip.